Amazon remains the world's most valuable brand, expanding its worth nearly 25% to an estimated $187.9 billion in 2019, according to the just-released Global 500 for 2019, released today at the Davos World Economic Forum by Brand Finance. 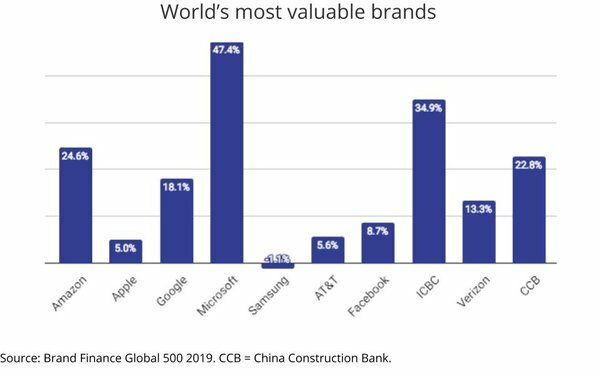 Apple remained the world's second most valuable brand, albeit with a relatively moderate growth of 5.0%, and Google remained No. 3, expanding its value 18%. Other than Facebook holding on to seventh place, all other top 10 rankings shifted in 2019. Given what a rocky year Facebook had in terms of both its underlying financial value, as well as user and regulator esteem, it's remarkable that its brand value continued to expand, rising 8.7% to $83.2 billion. "While Facebook secured its spot as the 7th most valuable brand, its overall brand strength declined with the second worst Brand Strength Index performance in the top 100, decreasing 11% to 82.9," Brand Finance explains in the report, adding, "Following a succession of scandals – including the Cambridge Analytica data misuse, the role the platform played in spreading fake news, and a network security breach – it is no surprise that there remains significant distrust in the brand. Facebook must improve its reputation for handling data and demonstrate it can thwart the spread of misinformation if it expects to improve its brand strength in the coming year."